Ohhh man! I remember in years past when the scent of cinnamon would fill our home, it always meant time with family. It could be cinnamon raisin toast on my grandmother’s farm, snickerdoodles straight from the oven, good old-fashioned Russian tea, or even apple pie. That spicy cinnamon scent meant something good was coming my way. 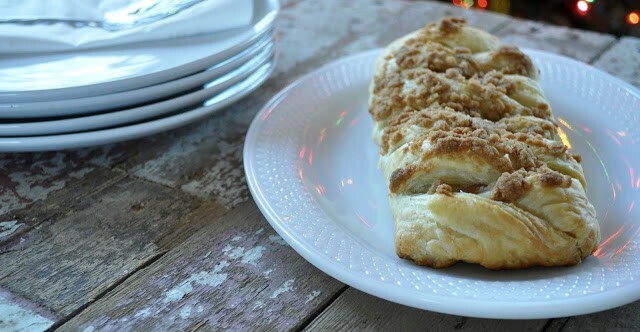 Nowadays that spicy scent signals these warm streusel topped apple pastries, Apple Cinnamon Streusel Ladder Loaves. Because you start these quick apple pastries with pre-made puff pastry dough, these Warm Apple Cinnamon Streusel Ladder Loaves come together in a snap. Be sure to thaw the frozen puff pastry dough in the refrigerator beforehand so you’re ready to work! If you thaw the puff pastry at room temperature you risk melting out the butter before it ever gets a chance to cook. That will ruin any chance of a lovely puffy pastry. I am absolutely speaking from experience. They may be quick to prepare but, their lovely cinnamon apple scent brings memories of long past Christmases and the promise of new breakfast traditions at the same time. You can make these the night before and let them cool their jets in the fridge overnight. They need to chill for at least 15 minutes before baking. If you plan to bake them the next day go ahead and cover them so they don’t dry out. Then when you’re ready to bake them simply pop them in the oven for a quick breakfast pastry. These make a wonderful addition to any family morning where lingering with coffee and chatting is a requirement. The smell of the cinnamon and apples makes me feel like I’m a child again. The spicy cinnamon scent of Apple Cinnamon Streusel Ladder Loaves baking is a comforting smell that means good things are coming your way.